A Game of Cat and Shark: Francesca Schiavone, That's Who. Francesca Schiavone is the 2010 Roland Garros Women's Singles Champion. Schiavo definitely goes against the grain of up-and-coming prospects. She's got a one-handed backhand, which she alternates between a topspin and a mean slice. She also likes throwing uppercuts after winning big points and rolling on and kissing the dirt after winning a grand slam. And there's the turning 30 thing that I'm sure will be mentioned a lot when articles about her are written. I was rooting for Sam Stosur to win, just because of her upset wins over Justine, Serena and Jelena, but FranSchiav just threw about everything she had on her shots, so while Sam's groundstrokes and serves were generally not hitting the mark (probably due to nerves), FraniSchavi just kept on excitedly pumping her fist and playing fiery, aggressive tennis that surprisingly overwhelmed Sam. 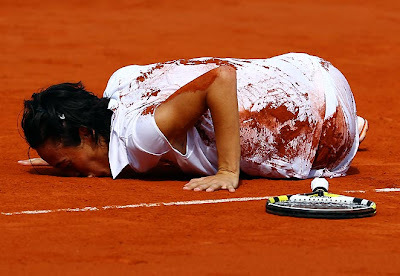 So Francesca Schiavone, 2010 Roland Garros Champion, congratulations on an unlikely but deserved final win. Did she just kiss that clay court?